Come for the fun, stay for the great deals in Tetherwood! schools within walking distance. Or if you like to golf and take leisurely walks by the canal to watch the boats pass - this is the perfect community for you! We are now over 80% sold out in Tetherwood Estates, so don't miss your chance to be part of this homey community. Single detached homes start at $229,900. For more information, visit our website here. We have lots of models completed, on the go and in the pipeline! They are selling so fast, we have barely had a chance to move in. If you are looking for bungalows or 2-storeys in Niagara, we have an amazing promotion being introduced at the Parade of Homes this weekend. If you sign a firm offer and close before December 31st, 2015 - we will take an additional $10,000 off the sale price on closing. This offer is only on valid on specific model homes, visit Vingy in Tetherwood this weekend to find out more! step into the home, the hallway and foyer are very spacious and welcoming. Everything you need is on the main floor! At the front of the home, there is a den or home office space. While your master bedroom, 3 piece ensuite, and even your laundry are on the main floor. Your garage door entry and laundry all stem off of the main floor hall that is all tiled. The tiled backsplash really finishes off this kitchen. 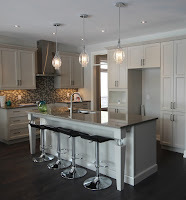 It compliments the oak kitchen cabinets perfectly - and the large island and open concept design into the living and dining room, make this a delightful entertaining area. If you are having company or overnight guests, there is over 700 square feet of finished living area in the basement. This includes a recreation room, third bedroom, and third bathroom! There is also central air-conditioning installed - and if our summer has any extreme temperatures like the winter we just had, you are definitely going to be needing it! 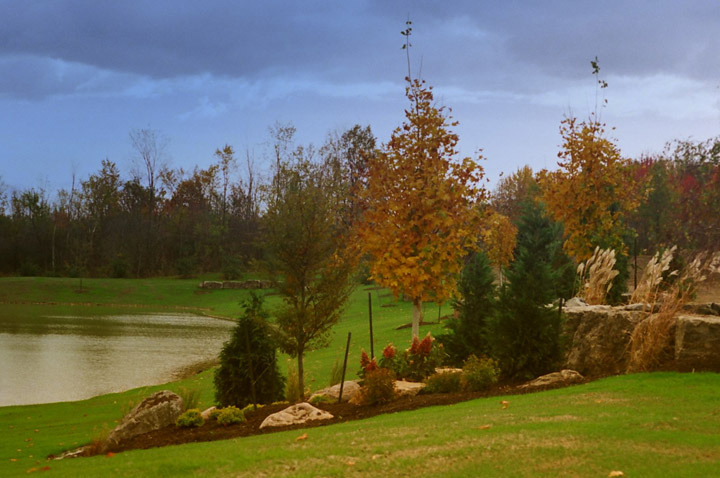 Click HERE for more information on our model homes! 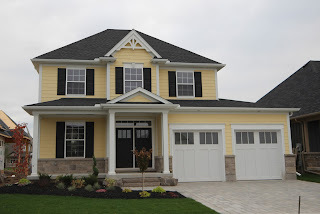 *Reminder: For the Parade of Homes (May 30/31st) our models will be open from 12-5pm. We will be giving away free swag bags to the first 20 people at each of our model homes this weekend - we will also be having a draw for 18 holes of golf (with cart) for 2 at Sparrow Lakes - ask our sales associates for details! Watch for the Parade of Homes insert in The Standard, The Tribune, and The Niagara Falls Review on Thursday, May 28th - it will have a map and directory of all participants. Click HERE to see the electronic version. Welland. It is a sprawling site, leaving plenty of space for parks, walking trails and other professionally landscaped community areas. New homeowners in this community have everything at their fingertips - shopping and recreation amenities are a stones throw away. There is even a beautiful golf course, Sparrow Lakes, just around the corner. Melting into the serene setting, the Coyle Creek Estates community will provide spacious luxury living, a relaxing locale and peace of mind for the environmentally aware. With ONLY 5 lots left in Coyle Creek, there is limited opportunity left to be a part of this beautiful community - don't miss your chance to build your dream home! Detached homes start from $264,900. 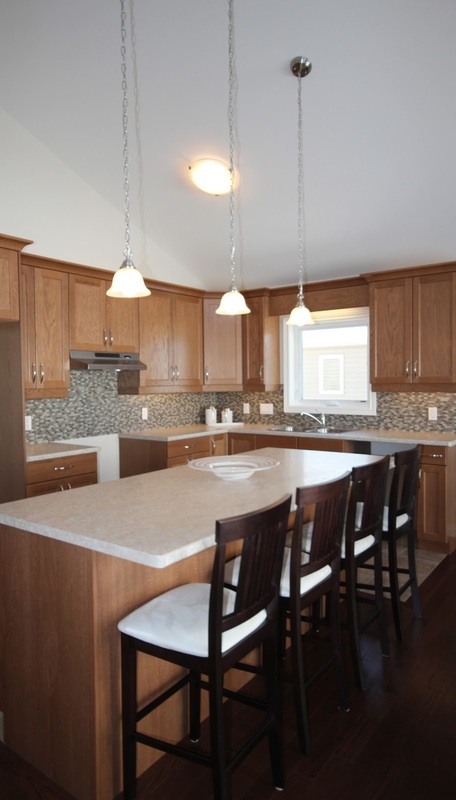 For the Parade of Homes we will be showing 2 of our models - The Hampton and The Dorchester. This was one of our fastest selling model homes, you have to come see what all the fuss is about! This gorgeous bungalow has 2 bedrooms and 2 bathrooms. 9 ft ceilings throughout the main floor add to the spacious feel of the open concept design. There is no lack of space for entertaining - whether you are having a dinner party in your formal dining room, a casual tapas night using your large kitchen island and great room, or hanging out in the finished basement. You could even move the party outside under your covered deck (with Sienna Pressure Treated Wood)! The kitchen in the Dorchester is one of my favourites - it features Elmwood cabinets and Cambria Quartz Stone countertops. As if that wasn't enough, there are crystal orbs in the legs of the island to make it even more elegant. Other features include under cabinet lighting, soft close, and plenty of pots and pan drawers. The Hampton is the perfect home for a family - the chic and sophisticated exterior embody everything I think of when reminiscing on the "American dream" home, it's just missing the white picket fence. The James Hardie siding and shutters are complimented by the interlock driveway and fully landscaped gardens. As soon as you walk into this 2-storey home you are welcomed by a statement oak staircase and beautiful foyer. There is a formal dining room at the front of the home, as well as a dinette within the open concept kitchen and great room area. All 3 bedrooms are upstairs, with a separate loft area for the kids to enjoy, overlooking your grand foyer. If you need a night to relax and just get away, escape to your master bedroom with your private, 5 piece ensuite! You can soak in the tub with some candles lit, or take a nice shower after a long day in the glass tiled unit. Do you have a boat or plan to do lots of entertaining in your backyard? 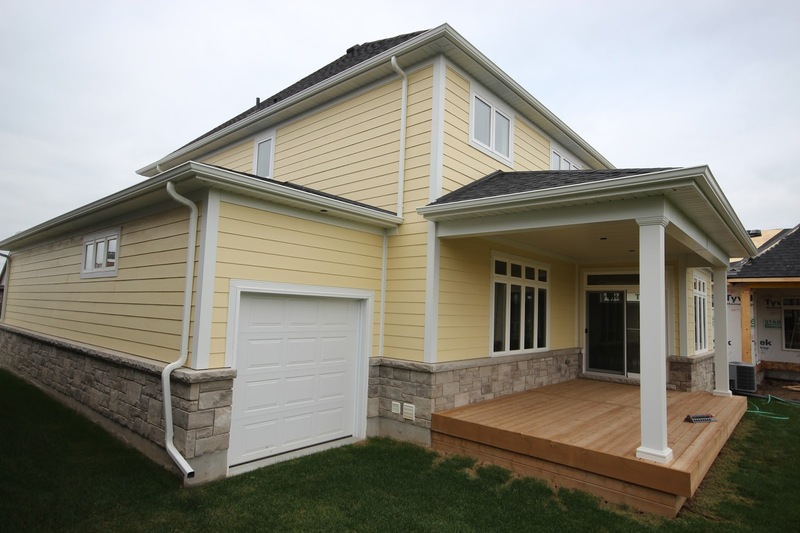 This custom Hampton has a tandem third bay garage with a rear overhead garage door. We are excited to be participating in Niagara's Parade of Homes on May 30th & 31st. In partnership with the Niagara Home Builder's Association, we will be showcasing our model homes along with 11 other local home builders. By visiting any of the participating model homes, you could win a Backyard Oasis (the more you visit, the more ballots you receive)! You could also win with Rinaldi Homes - the first 20 people at each of our models will be receiving a FREE swag bag. We want you to enjoy what Niagara has to offer, so the swag bags feature tasting at some of our local wineries in the Twenty Valley area - including Megalomaniac, Vieni, and Sue-Ann Staff Estate Winery! Another way to win is with our punch cards. They will be at each of our models for you to pick-up. If you visit all 4 of our model homes and complete the punch card, you will be entered in a draw to WIN a round of golf for 2 (with a cart) at Sparrow Lakes Golf Club! Sparrow Lakes is located just around the corner from our Coyle Creek Estates community. Want to see what we will be showcasing on the weekend? This week across all of our social platforms we will be featuring each of our communities that will be part of the Parade of Homes. Building for Change in Niagara! What a better way to start our blog, then to talk about one of our latest community events! the family who won our playhouse in the auction. Niagara's first Playhouse Competition was on April 19th and it was all about building for change, as it kicked off National Victims of Crime Awareness Week. 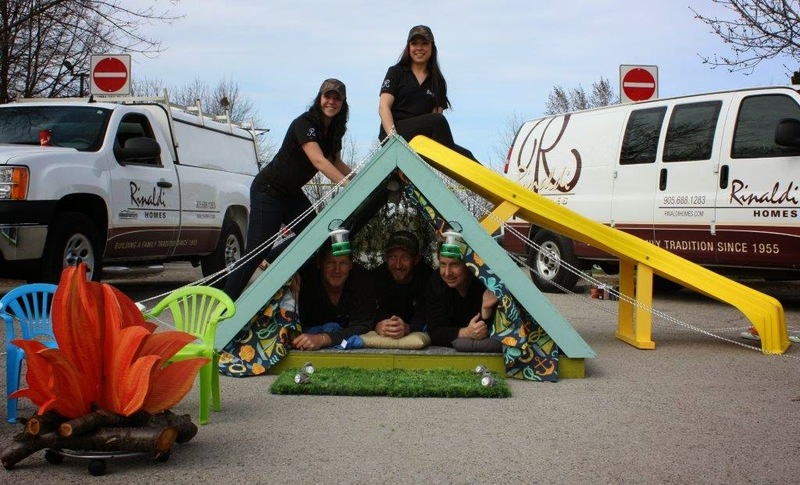 Along with Parklane and Gatta Homes, we built our own custom playhouses to be auctioned off to support Victim Services Niagara and the Kristen French Child Advocacy Centre Niagara. The Kristen French CACN is a safe place to help, heal and end abuse for children and youth who have been physically or sexually abused, become the targets of internet luring, or who have witnessed violence. Before Kristen French CACN existed, a case of child abuse was generally handled by taking the child to different locations - to medical facilities; police facilities; offices at Family and Children’s Services. This round of visits is confusing, upsetting and is detrimental to the child. The Kristen French CACN improves on this process. They provide a child friendly, non-threatening single location where those involved in the investigation come to the child, and supportive services such as counselling are offered. In addition to their “safe haven” mandate, they also take on important advocacy and prevention roles. Taken together, these activities fulfill Niagara’s Children’s Charter where they commit to looking after the children’s fundamental needs so they are better able to contribute towards creating a civic community. Today’s children will be the leaders of the future! and Victor had a little fun with our finished product before it was auctioned off!